Planning renovations or moving into a new home with your family is an exciting time, but it can also pose many risks to young children. It’s important to be aware of the best ways to go about child-proofing a house so that you can be assured your kids will be as safe as possible inside. You can minimize the potential harm to the smallest members of your family by following a few simple tips. Naturally, staircases pose a fascinating challenge to a young child. Installing a child-proof gate or barrier at the foot of the stairs, both top and bottom, is crucial for safety until your child is confident enough to climb up and down on their own. The gate should be self-locking and high enough to prevent your child from climbing over it. Once it has been installed, make an extra effort to keep the surrounding area clear of things which could be used to climb over the fence. Anything made from glass poses a potential danger to your children while they are young and vulnerable, and windows are no exception. If you have windows which open at or near floor level, make sure they are securely locked whenever your child is roaming around the house, and in any case, it’s best to eliminate any chance of them slipping through the opening by narrowing the width of the opening. If done improperly, renovations can affect everything from the quality of life to the structural integrity of your home. You don’t want to be creating improvements that would make your home be picture-perfect for a magazine but totally impractical for you and your children. In the interest of avoiding design mistakes when renovating, you could consider enlisting the help from a professional contractor or building architect who will be able to ensure the safety and stability of any new renovation plans. Young children are naturally curious and likely to view closed drawers and cupboards as undiscovered treasure troves. If you don’t want your child having access to sharp cutlery, scissors, or any other cooking instruments, securing your drawers with child-proof locks should do the trick. The kitchen and laundry are prime spots for hazardous substances, so consider building above-ground storage space for chemicals in these spaces. If neither floating cabinets nor shelving is an option within the available space, make sure the drawers are secured with child-proof locks whenever they’re not in use. It’s also important to keep an eye out for any small objects which could be ingested by a curious child, such as cotton balls, toothpaste lids, and the disposable heads from shaving razors. Storing any gardening products or tools safely is a great starting point. They can be just as dangerous as most kitchen and laundry detergents, and easily overlooked if not used regularly, but the other danger often overlooked in the garden is the plant life itself. Check whether any of the plants in your garden are dangerous to touch or ingest, as your child is likely to put anything and everything in their mouth at some stage. Any potentially hazardous houseplants could make great gifts for any child-free household. 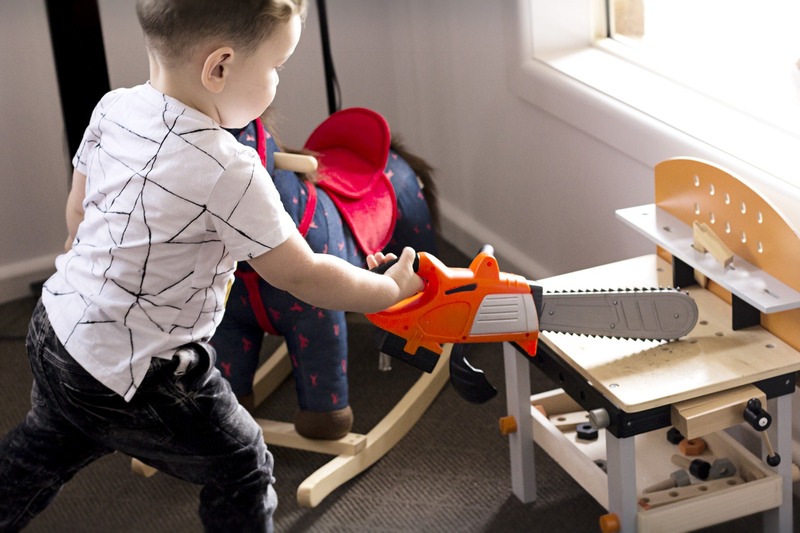 When your children first learn to walk, and then run, furniture with sharp edges becomes a serious safety hazard; leaving them alone with your new coffee table for just a few moments could result in a nasty injury. The risk can be significantly reduced by choosing furniture without pointed corners or curving the corners on furniture you already own. If you have a pool, the law requires that you install a fence which measures up to strict regulations in order to minimize risk. This is even more important when it comes to keeping children safe. The bars in the fence should be narrow enough to prevent a small child from slipping through, and the door should swing closed and lock automatically. Once your fence is installed properly, just make sure nothing is left around the outside of the fence which could be used to climb over it. There’s a lot to remember when it comes to child-proofing your home, but the knowledge that your children are as safe as possible when they’re inside should make all the trouble worthwhile. These tips will take some of the stress out of the early years, but you should still make sure to keep a close eye on them at all times. About The Author: Bethany Seton is a recent economy graduate. Before settling in an office, she decided to follow her passions for writing and traveling. Currently, she travels with her laptop and writes for various blogs, hoping one day she will gather all the experience she gets in one book.